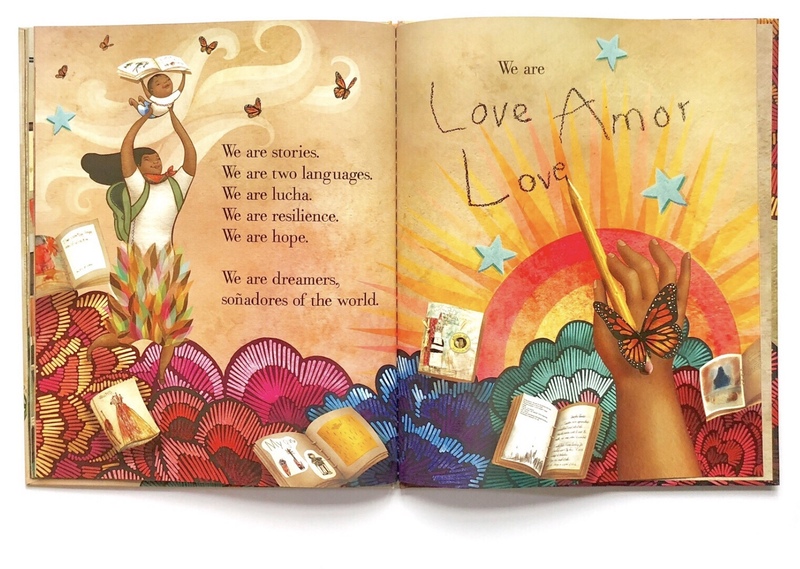 Dreamers is among the ten NYPL 2018 Award-Winners in the category Children's books. 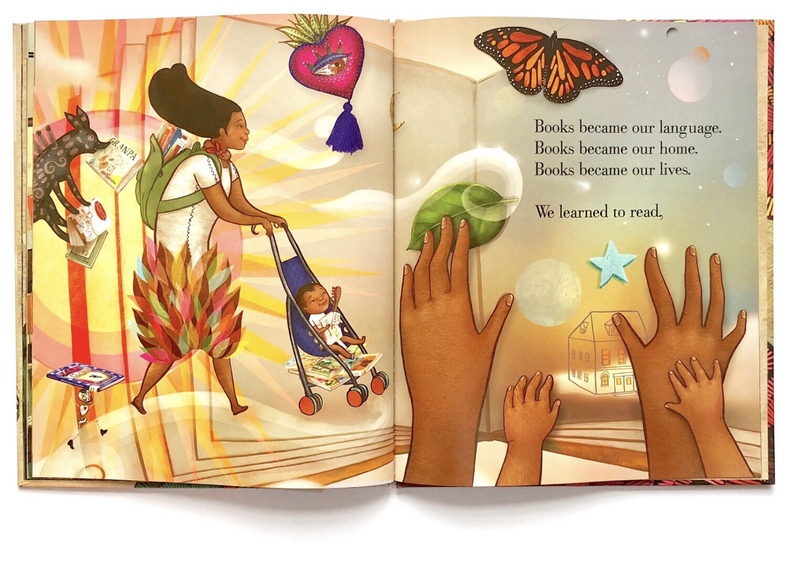 Every year, this award is given jointly by The New York Public Library and The New York Times and "honours the unimaginably talented illustrators who give kids yet another reason to love reading". 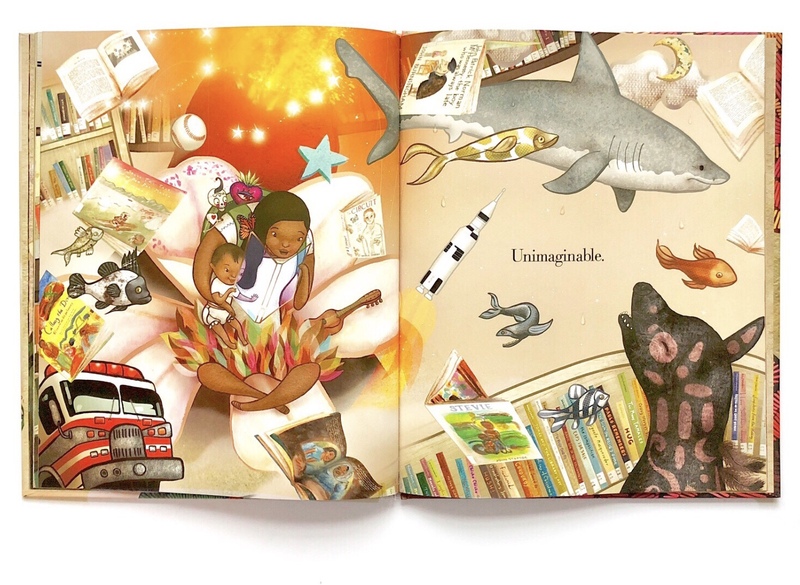 "Morales’s colorful collages create a wonderful dreamlike effect in this powerful story of a mother and child leaving Mexico on an unexpected journey in search of a new life". 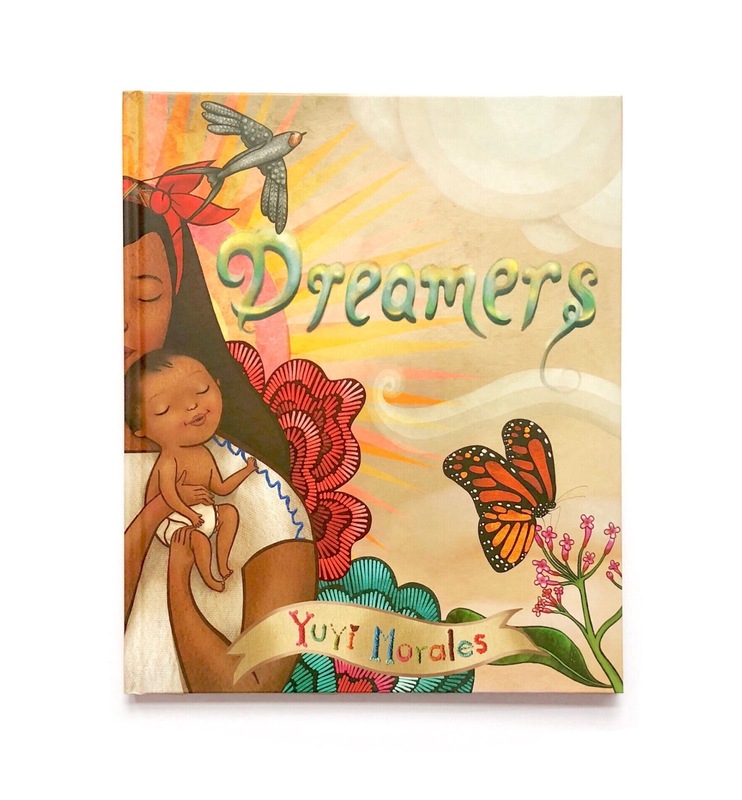 Caldecott honor, self-taught author/illustrator Yuyi Morales tells the autobiographical story of a mother who leaves Mexico with her newborn son to start a new life an a 'strange and unfamiliar place' The United States of America. 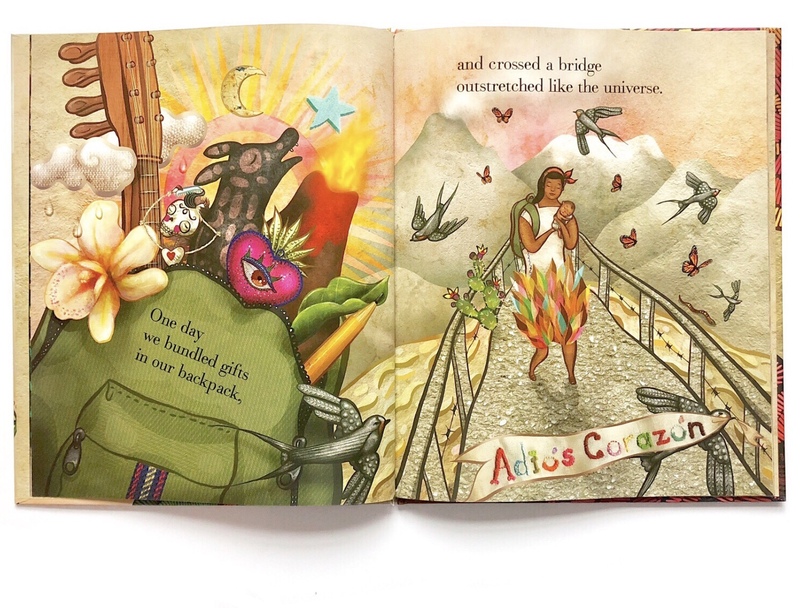 In 1994 Yuyi crossed the bridge from Ciudad Juarez, Mexico, to El Paso, Texas, her backpack filled with memories of her land: a guitar, a Calaca, a flower. but there's also the warmth (the sun, a vulcano) ad the heart. She was marrying her son's father, a US citizen, and found out soon after that because of America's Immigration law she would be unable to go back to Mexico. She and her two-months-old son would be 'permanent residents', immigrants. 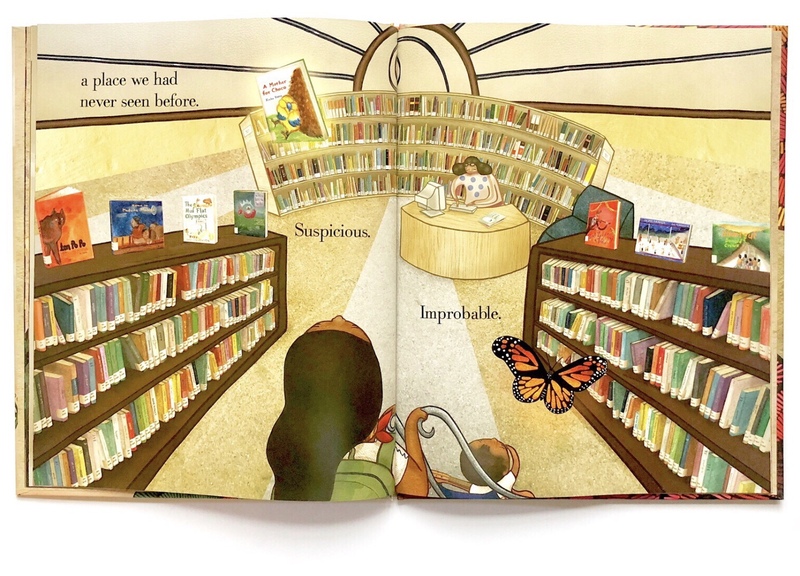 The woman goes through the struggle of cultural distance and through the frustrating silence inflicted by the language barrier, until she discovers the Public Library where literacy will finally open the way to integration. 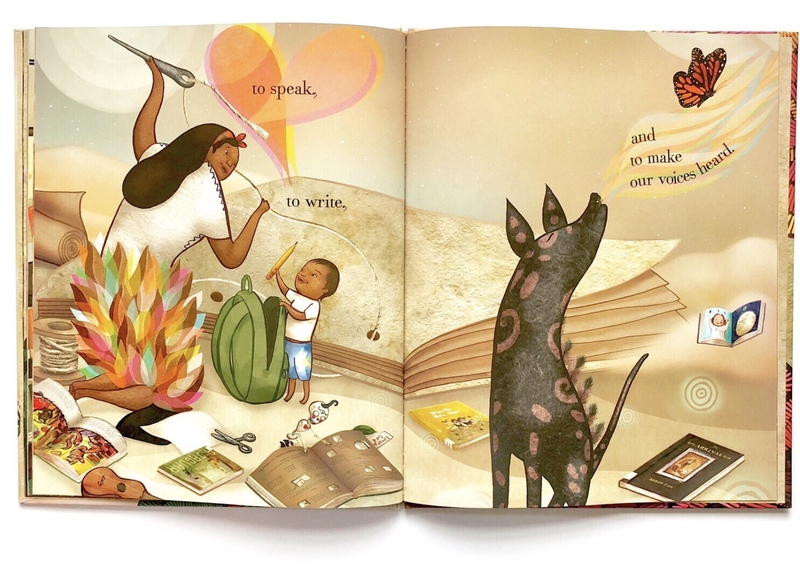 In one of the most intense spreads the small volcano that the woman carries in her backpack erupts while reading, and the Heart and the Calaca peek from behind her back to listen to the story: picture books allow her to both reconnect with her past, keeping it alive, and to explore faraway places, in a virtuous circle of trust, learning, knowledge, self-confidence, and increasing sense of belonging. The palette marks the separation between the inner and outer world: grey and sandy brown for cold American cities with their dull rows of houses, as opposed to warm earth colours from brown to green to brick red and pink (the colour of the heart) that burst from the mother's backpack and illuminate her throughout the book, as well as the books in the library, finally dying her world as she starts to speak English, finding a voice and new hope. 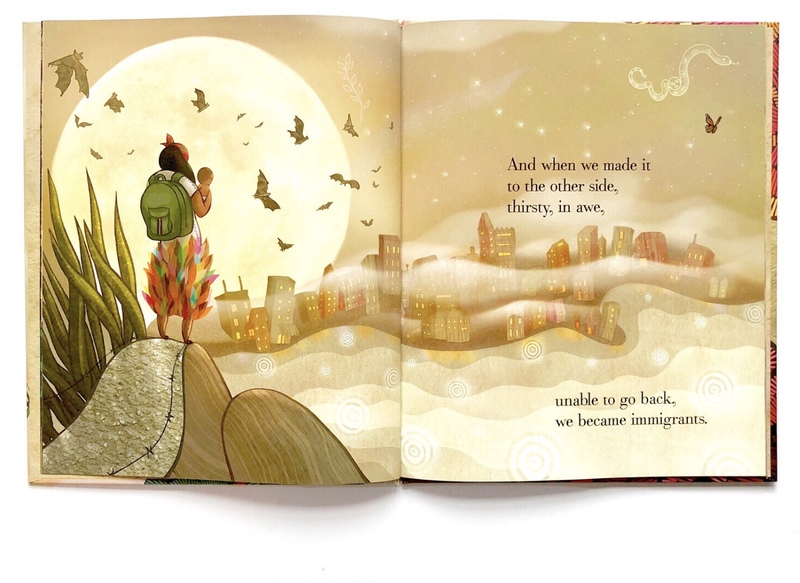 Here, the word 'Dreamers' does not refer to the political status of undocumented migrants who arrived in the US as children, as it is used today, but it is used as 'Dreamers of the world' to refer to the emotional status of all immigrants, who move to unfamiliar countries with their baggage of memories dreaming to build a better future, also thanks to their past. 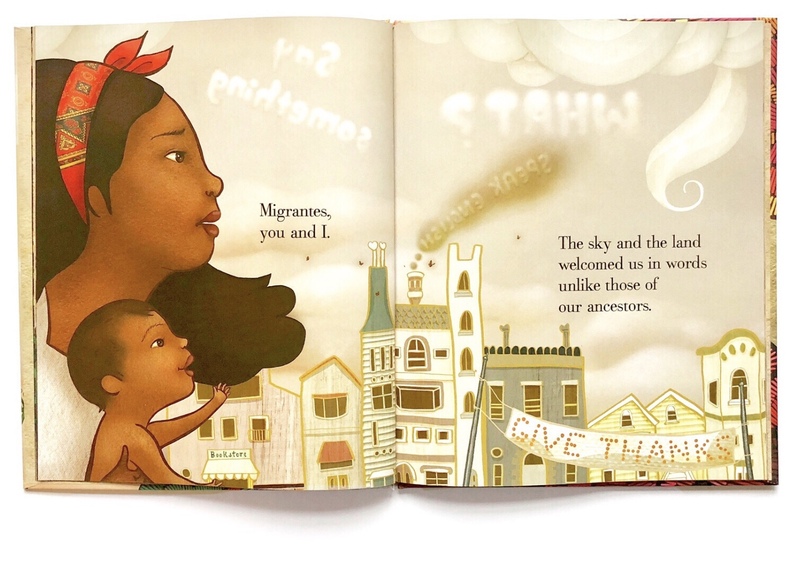 Dreamers is a heartfelt story charged with visual symbolism and told with enthusiasm mixing English and Spanish words, dealing with an important topic, that of migration, and exploring one essential pathway to freedom, integration and progress in multi-cultural societies. 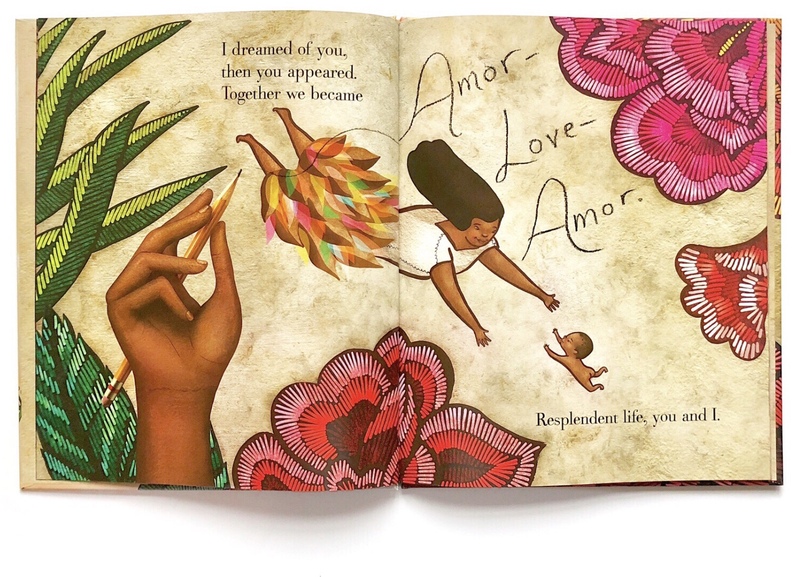 Although Morales' emphatic style might resonate with different readers more or less effectively, Dreamers remains an important and timely story to be told. In this interview with the publisher Neal Porter, the author explains how she got serious about making this book after the Presidential election in 2016. Morales: Before that night, I thought, there is no way Trump would be elected. He was not a person I would even let inside my house, let alone be the leader of a free country. I was so angry. The next morning, it felt like I’d experienced a bomb or earthquake… like my life had crumbled. 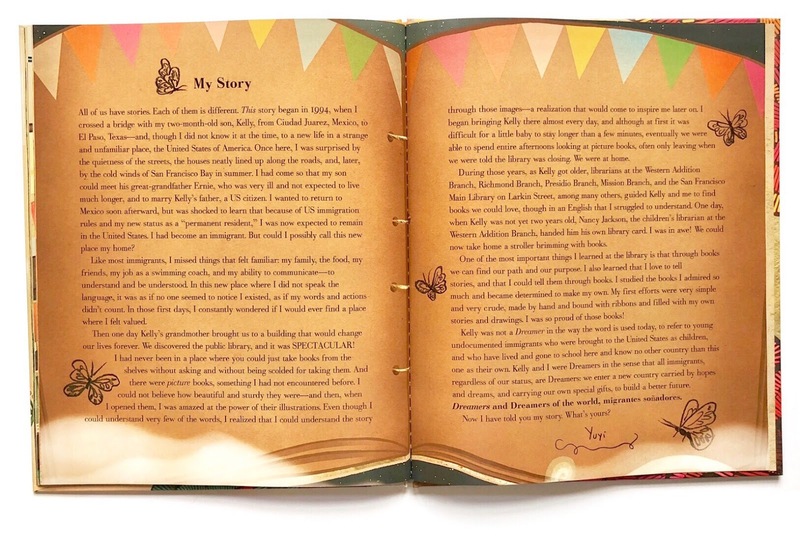 In so many ways, he represented the opposite of everything I had worked for and grown into as a children’s book author: how we treat others, how we communicate, how we fight against bullying, and how we build our perception of ourselves. Everything stopped, and I couldn’t work on anything. Trump was so vocal against anything that came from the Mexican side of the border. If I believed the things he said when I first came to the United States, I would never have made it. Neal Porter: [..] It’s inevitably a book that is political and makes a political statement. 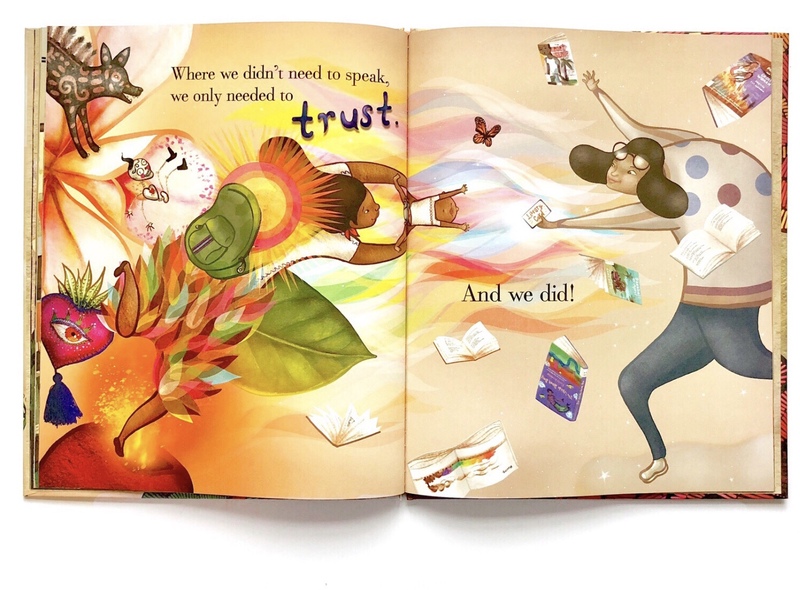 With that, what do you see as your role as a children’s book creator? What do you hope people will take away from Dreamers? Morales: To even try to be neutral in this time would be a disservice. 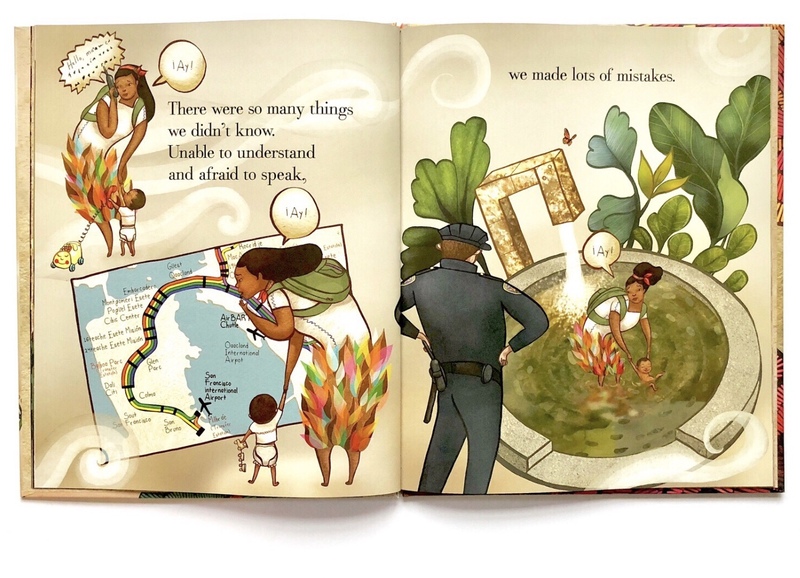 As a children’s book creator, I take on a huge responsibility in that I hope my book will raise consciousness and awareness in children. My voice might not always be the one worth hearing, but I feel that, in putting myself out there, I can open the doors for the stories of those who need more attention. The point of Dreamers is not that others can admire my journey. It’s an invitation that we should all use our own voices to tell our own stories.